Dingwall & Highland Marts Ltd, March 20: sold 711 store cattle and 65 OTM cattle. Bullocks (369) averaged 223.3p and sold to 288.6p per kg for a 395kg Limousin cross from Park Farm, Nairn and £1,240 gross for a pair of 665kg Limousin crosses from Ashley, North Kessock. Heifers (340) averaged 211.6p and sold to 346.0p per kg and £1,090 gross for a 315kg Aberdeen Angus cross from Park Farm and £1,090 gross for a pair of 557kg Aberdeen Angus crosses from Wester Dunnet, Thurso. Young Bulls (2) averaged 204.1p and sold to 212.5p per kg for a 320kg Limousin cross from Sornum, Easter Kinkell and £810 gross for a 410kg British Shorthorn from 68 Foindle, Lairg. OTM prime & feeding cows (64) averaged 119.2p per kg and sold to 166.3p per kg for a 475kg Aberdeen Angus cross from Charleston Farm, Thurso and £1,130 gross for a 815kg Simmental cross from Lower Whitebog, Fortrose. OTM bulls (1) sold to 168.9p per kg and £870 gross for a 515kg Limousin cross from Dalmagarry Farm, Tomatin. Bullocks up to 250kg – Erchite, Dores, £540, 248.9p; 251 – 300kg – 22 Achfrish, Lairg, £670, Westburn, Thurso, 231.4p; 301 – 350kg – Kennachy, Forss, £890, 259.5p; 351 – 400kg – Park Farm, Nairn, £1,140, Kennachy, 258.4p; 401 – 450kg – Park Farm, Strathpeffer, £1,080, Balmaglaster, South Laggan, 258.5p; 451 – 500kg – Kindeace Farm, Alness, £1,200, 252.6p; 501 – 550kg – Park Farm, Nairn, £1,180, 233.7p ; 551 – 600kg – Torgorm, Conon Bridge, £1,200, 206.9p; 601 – 650kg – Ashley, £1,200, 193.6p. Heifers up to 250kg – Auchmore Farm, Muir of Ord. £610, 244.0p; 251 – 300kg – Auchmore Farm, £660, Westburn, Thurso, 237.1p; 301 – 350kg – Westburn, £820, 244.1p; 351 – 400kg – Park Farm, Nairn, £930, Kennachy, 243.9p; 401-450kg – Raitcastle Farm, Nairn, £980, Udale, Poyntzfield, 229.6p; 451-500kg – Kindeace Farm, £1,080, Shawpark, North Kessock, 227.9p ; 501-550kg – Wester Dunnet, Thurso, £1,000, Cragganvallie, Inverness, 191.5p; 551-600kg – Wester Dunnet, £1,085, 195.7p. OTM prime & feeding cows (64) averaged 119.2p per kg and sold to 166.3p per kg for a 475kg Aberdeen Angus cross from Charleston Farm and £1,130 gross for a 815kg Simmental cross from Lower Whitebog. OTM bulls (1) sold to 168.9 per kg and £870 gross for a 515kg Limousin cross from Dalmagarry Farm. OTM cows: Lochquoy Farm, Castletown, (PI), 157.3p; Charleston Farm, (AAX), 156.4p, (SimX), 153.4p; Roadside Farms, (LimX), 146.2p. United Auctions, Stirling, March 20: sold 1507 store cattle, also 118 cast cows and 865 store & breeding sheep. Bullocks (842) -averaged 222.31p to 259.60p per kg for a 339kg CHX from Kilbrook House, and to £1270 for a 600kg CHX from Yonderhaugh. Dairy Bullocks (15) – averaged 152.88p to 172.40p per kg for a 586kg MOX from Killellan, and to £1010 for a 586kg MOX from Killellan. Heifers (637) – averaged 212.94p to 259.90p per kg for a 404kg LimX from Balafark, and to £1270 for a 614kg LimX from East Dowally. Young Bulls (9)- averaged 207.56p to 209.20p per kg for a SimX from Gateside, and to £730 for a SimX from Gateside. Beef Cows (102) – averaged 132.74p to 177.20p per kg for a LimX from Knockraich, and to £1270 for a LimX from Chartershall. Dairy Cows (13) – averaged 110.92p to 134.80p per kg for a HFX from High Langmuir, and to £995 for a HOX from Wester Borland. Forward Cattle (3)- averaged 172.84p to 190.00p per kg for a SimX from Devonshaw, and £1030 for a SimX from Devonshaw. Bullocks:Up to 250kgs- Balgowan £620, 201.80p; 251-300kgs- Gateside £680, Craigo £231.60p; 301-350kgs- Kilbrook £880, 259.60p; 351-400kgs- Loanhead of Duchally £970, Wester Ochtermuthill 251.40p; 401-450kgs- Auchenflower £1070, 253.60p; 451-500kgs- Dyke £1125, Hilton of Beath 234.0p; 501-551kgs- Longcarse £1150, 227.70p; 552-601kgs – Longcarse £1225, Dyke 209.70p; 602-651kgs- Yonderhaugh £1225, 199.70p; 652-701kgs- Yonderhaugh £1270, 192.40p. Young bulls: 301-350kgs– Gateside £730, 209.20p; 351-400kgs- Gateside £725, 206.00p. £ per head- Chartershall (Lim) £1270, High Bent (BRB) £1210, Burnside of Balhaldie (AA) £1190, Gateside (BA) £1130, Kirkton of Lundie (Sim) £1130, Drumoider (Sal) £1110. PPK- West Park (Sim) 141.80p, The Craw (Sht) 140.70p, The Hillocks (Lim) 131.00p, Berryhill (CH) 119.60p, Drumoider (AA) 116.60p. United Auctions also sold 865 store & breeding sheep. Hoggs- Wester Greenside (Suff) £84.00; ); Drumoider (Tex) £77.50; Lodgehill (Tex) £76.50; Drumoider (Mule) £70.00; Craigbrock & Langbank of Balhadie(BF) £64.00. Breeding sheep- Whitebank for 1 crop TexX ewes scanned in lamb to Tex & Suff £120. Caledonian Marts Ltd, March 18: had forward 541 Store Cattle at their fortnightly sale. Bullocks averaged 205ppkg selling to 252p for Limousins from D & L Graham, Mains of Burnbank, Blairdrummond and to £1250 for Limousins from A & J Orr, Hill O Harthill. Heifers averaged 196ppkg selling to 241p for Limousins from M Campbell, Glenstockadale, Stranraer and to £1170 for British Blues from Lochhead Farms, Stirling. Black & Whites averaged 143p selling to 177p for British Friesians from Kirminoch Farms, Kirminnoch, Ervie and to £810 from D J & R D Neill, Kirminnoch, Stranraer. Also forward were 409 Store Hoggets, Ewes & Breeding Sheep. Top price of the day went to E Erskine, Inchie, Port of Menteith for a pen of Mule Gimmers, scanned Twins at £142. Store Hoggets sold to £79 for a pen of Texels from R Graham, Airthrey Kerse. 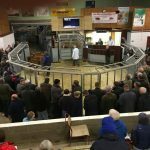 Caledonian Marts Ltd, March 19: sold 2,227 Prime Hoggets, Ewes and Tups. A large show of Heavy Hoggets (54 per cent of the sale weighed 46kg+) resulting in the trade being easier on the week, with 1793 selling to average 187.5ppkg (-4.1p on the week). Export Hoggets short of numbers, and many more could have been sold to sellers advantage, with 836 SQQ Hoggets averaging 200.4ppkg (+2.6p on the week). Top price of the day went to Doune Farms, West Lundie for a cracking Beltex Hogget at £110. Top price per kg went to J M McDonald, Newbigging for a pen of 37kg Hoggets at 254ppkg. Also forward were 434 Cast Ewes and Tups. All classes remained a similar trade to that of last week, and many more could have been sold to sellers advantage. Heavy Ewes averaged £82.17 selling to £130 for an outstanding pen of Texels from C G Young, Lamberton, Berwick-on-Tweed. Light Ewes averaged £54.41 selling to £66 for a pair of Blackfaces from J Brown, Greencraig, Falkirk. Cast Tups sold to £95 for a Texel from A M Duncan, Easter Dullatur, Glasgow.